Bob Dion found this postcard at a flea market in 1998. The postmark is 1966, although we believe the picture dates earlier than that. The Malletts Bay Boat Club was founded in 1936 with the construction of a clubhouse on leased land directly to the west of our present mooring area. In all twenty-one men joined the Club as charter members including Paul Raine, W.R. Chris Christopherson, Gillette Stephens, Pete Peterson and the three Adams boys -Harry, Roger, and Walter. Dues were established at $10.00 per year! There are different stories about how our Club came to be founded. One frequently heard version is that the original members were sick and tired of the highfalutin social atmosphere at the Lake Champlain Yacht Club. However, according to the Chittenden County Historical Society (to whom we are greatly indebted for much of the material in this history), our Club was founded after ice severely damaged the piers of the Lake Champlain Yacht Club which then stood at the foot of College Street. 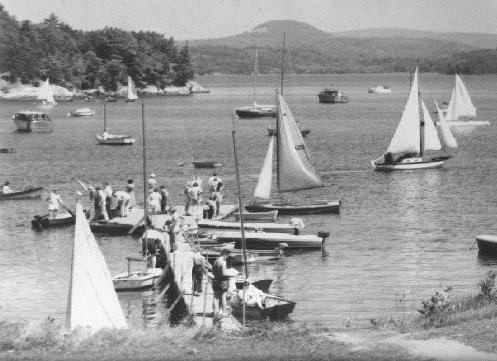 LCYC then relocated temporarily to the Allenwood Inn and the members were obliged to moor their boats in a rather exposed harbor in Shelburne Bay. That first winter they constructed a small fleet of Snipe Class sailboats. They registered their little fleet with the National Association and by the following summer our long and proud tradition of top-flight sailboat racing was launched. The Clubs first Race Week was held in August of 1937. I thought that someone might be interested in this photo taken in the early fifties I believe. When I was a kid my dad was a member and I spent many happy hours there. We owned the power boat on the left side of the picture. Now I sail a Pearson Vanguard out of the South Shore Yacht Club in Milwaukee, WI. In January of 1938 the first parcel of our present land - then known as the Salisbury property - was purchased for the handsome sum of $3500. Why not? In only two years our membership had grown from 21 to a whopping 66! The property included a two story farmhouse which was located where our present building now stands. The old farmhouse was in poor condition but they jacked up the porch, ripped out the interior and paneled the main room in knotty pine. A huge natural stone fireplace warmed the room and built-in benches were installed along two of the walls. Wives of the members made bright and attractive sailcloth-covered pads for the benches. By 1939 the Club was entering the big time. A steward was hired for the summer ($50.00 total salary) and the dues were raised to $15.00. We made Yachting magazine with an article in their May 3rd issue that discussed the proposed Long Distance Race. And (hard to believe) we sponsored power boat races that year. In spite of the threat of World War II during the summer of 1940, the first Long Distance Race was finally sailed - 75 miles! The course took the yachts through the Rutland RR swing bridge at the west edge of the outer bay, around Valcour to Colchester light, around Schuyler Island to the Burlington Harbor, around Juniper Island, around the breakwater at Plattsburgh and back to the Club. In December of 1941, Pearl Harbor was bombed and the Club went on a "suspended basis". Membership dropped to 33 paid members and only crucial things were done, such as paying the mortgage, light bills and insurance. Gas rationing during the war was serious business and it was hard for members to even visit the Club. Three MBBC members were killed in action during World War II: Tobey Churchill, Raymond Gates and Charles Smith III. When the war ended in 1945, activities at the Club started up again. Two stewards were hired, house and dock repairs were made and a race schedule posted. The minutes of the January 22, 1946 Afterguard meeting reveal the startling prediction by Bill Freeman that "...within three years there will be 250 boats on Lake Champlain with mast heights over 20 feet!" But even more astonishing was the fact that membership at that time was dominated by power boat owners. The following year the Club incorporated and numerous improvements followed, including a dock installation and bulldozing of the waterfront in order to provide a beach and swimming area. 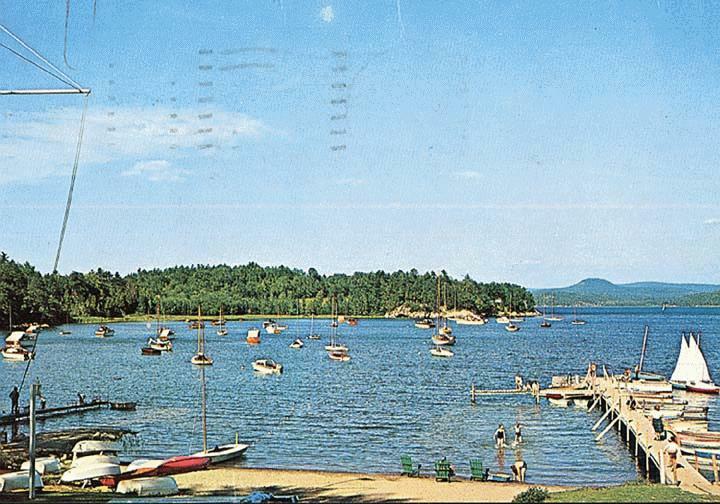 In the early 1950's, the Bisson camp and property was purchased to enable the membership to be enlarged and to increase lake frontage and mooring capabilities. The 1950's purchase involved land and a summer camp located almost exactly in the center of what is now our picnic area. The new building was designated as the adult Clubhouse and the old house was fixed over for the Club's younger members. In August of 1954 Bill and Dawn Hazelett started sailing classes to teach seamanship to 30 boys and girls ranging in age from four to fifteen years. They borrowed four sailing dinghies from the University of Vermont and three from St. Michaels College that first summer. At the end of the season Bill negotiated directly with a boat manufacturer in Holland and purchased kits to make 30 Indian Scouts, the official Youth Boat of the Royal Dutch Yachting Society. Our Junior Sailing Program has flourished ever since, thanks to being so ably launched by the Hazelett family. By 1959, Club membership was up to 111 and the Log listed 14 cruising auxiliaries, 20 day sailors (5 of them Lightnings) and 40 power boats! In 1962, we bought the Glamour Girl launch for $6100 and in the winter of '68-'69 the permanent dock was constructed and the hoist installed for something over $13,000. By the late 70's it was becoming evident that the Club was outgrowing its antiquated facilities. And so during the '79-'80 winter (one of the mildest on record, fortunately), the new Clubhouse, which had been designed by architect Colin Lindberg and built by past-Master Jim Reed's construction company, was completed. The Grand Opening was held on May 31, 1980, and a gala affair it was. Boating on Lake Champlain continued to grow in the 1980's and several of our neighbors decided to get into the mooring and dock business. This made our mooring area even more congested. In 1985, the Club purchased the Bissons' home and property located adjacent to their camp we had purchased earlier; this was deemed a necessary action to guard against the possibility of more commercial development and crowding in our mooring area. In 1986, we celebrated our 50th anniversary with a clam bake under a big tent complete with lobsters, clams, games for the kids and a Dixieland band. The year concluded with a large gathering at Bolton Valley attended by members of various Clubs. Tom Watson Jr. gave an illustrated talk about his adventures. We celebrated our 60th anniversary in 1996 with a big party at the Club and a slide / video show highlighting our sixty year history and in 2006 we celebrated our 70th year with another party at which past Masters were honored and former members attended. The changes over the years have been dramatic. The Club is now home to more than 160 regular, senior, and honorary member families with almost 200 sail and power boats of all sizes. The MBBC Web Site was created in 1996 to better maintain Club schedules, results and to communicate other information to the members and anyone else who is interested in learning more about MBBC. In 2005, a Women's Programs Committee was established to organize and host a variety of sailing and social events for women members and their guests. The Cruise Committee is more active than ever and plans activities throughout the summer which enable members to get to know each other. In recent years Club racers have won sailing events in the Pan American Games and other national and regional regattas. In 2004 the Club hosted the Sears Cup, which is a national youth sailing championship; this event was also won by our own local team of junior sailors. In 2001 we had the honor of hosting the Lightning North American Championship with more than 150 boats participating. In 2007, we hosted the Laser US National Championship and in 2009 we were successful in hosting the international championship event of the 2009 Lightning Worlds. In 2012, we hosted the Buccaneer NA's for a second time in recent years and 2013-14 saw us hosting the Shark US Nationals. We have also been the host venue for other regional and district championships of other one-design classes such as J-24, J-80, Etchells and Martin 16 (for disabled sailors). Each of these events showcase Lake Champlain as a great sailing venue to others around the country and the world. It also enhances our reputation as a club that can successfully host world class events. 2011 marked the 75th Anniversary of MBBC and a big party was held to celebrate our continuing success. The strength of the Malletts Bay Boat Club is like fine wine it improves with age. The spirit that built that tiny 24' by 10' Clubhouse in 1936 is very much alive and it bodes well for the future.